I am here, the place is buzzing. There are lots of people around. 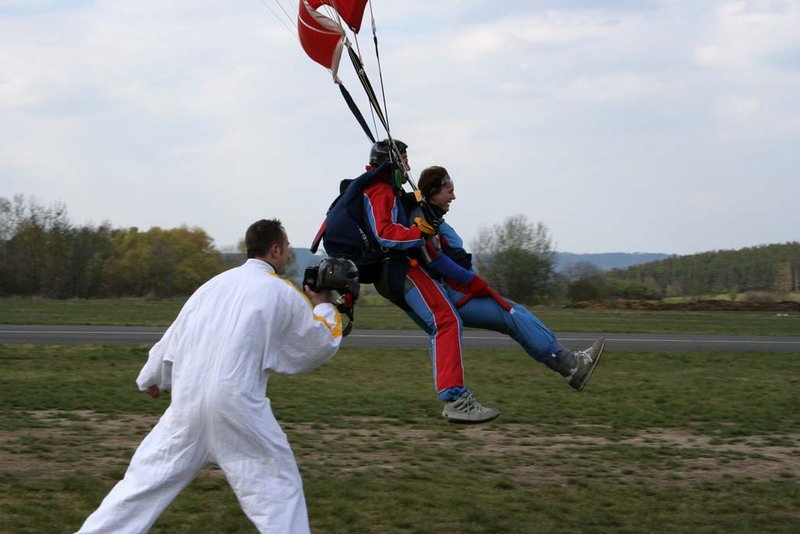 Some of them are running around in jumpsuits and parachutes, others have some strange "braces" �.the airplane engines are roaring, the skydivers are landing, some of them bloody fast. My stomach has just turned upside down. I call my contact and suddenly I am greeted by a guy, who has introduced himself to me as my tandem pilot. He starts explaining how it all works and shows me some photos. He had even jumped with 70 year old man or 130kg (20st) heavy lady. 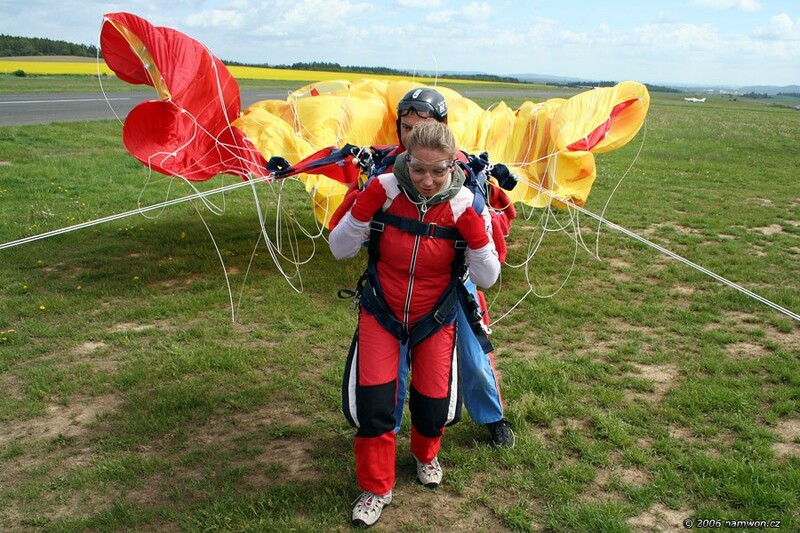 Suddenly I'm wearing a jumpsuit and those "braces", which they call a passenger harness; and we're practising freefalling and landing positions. Now they called out a take off for my plane L-410 At this moment, me and my instructor are joined by a camera man , who has a digital video camera attached to his helmet. I'm not sure how he wants to record us if I and my tandem pilot have 1 parachute and he has his own one. With a smile on his face he explains that he will hang on the side of the plane and exit together with us. 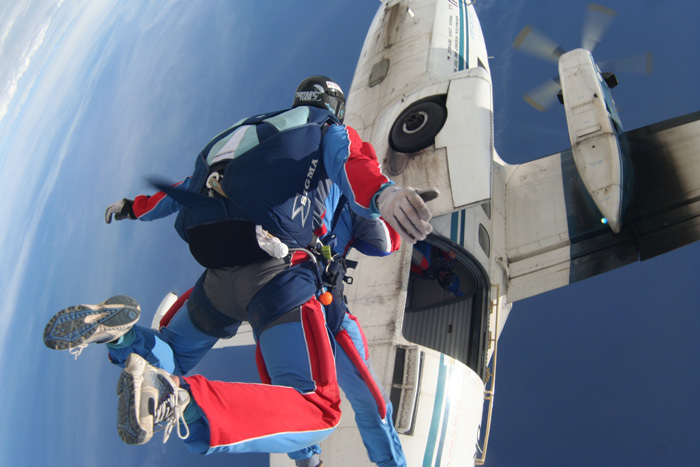 He can vary his freefalling speed to be at level with us which will give an impression that we're floating in the air rather than falling 200km/h (125mph). The plane takes off. Between waving into the camera and watching the clouds through the aircraft window, I'm trying to imagine the feeling that I am about to experience. I glance beneath once more, everything seems so small. The atmosphere in the aircraft is very friendly and full of jokes so I'm not even scared; even dry humour is not forbidden. 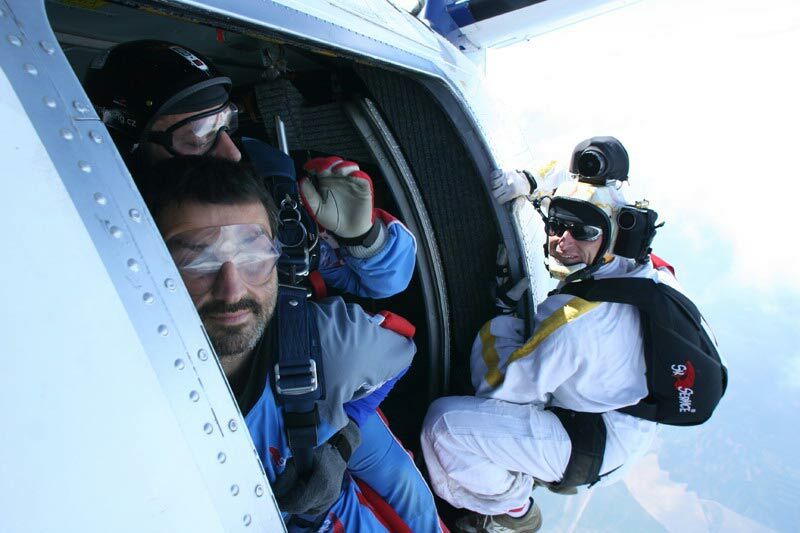 Within few minutes the big watches worn by all skydivers read quarter to� they are altimeters and we had just reached 3 000 m / 10 000 ft . The tandem pilot re-checks my harness, which he has attached to himself and tightens up the straps, uh! He sits down back into his seat with me on his lap. The pilot gives now a signal to open the door. The fellow passengers are disappearing in the hole in front of us. I certainly have butterflies in my stomach now! I put on the plastic goggles and trying to take few deep breaths. We approach the door in a slow and rocking motion. Our camera man is already hanging on the outside of the plane. 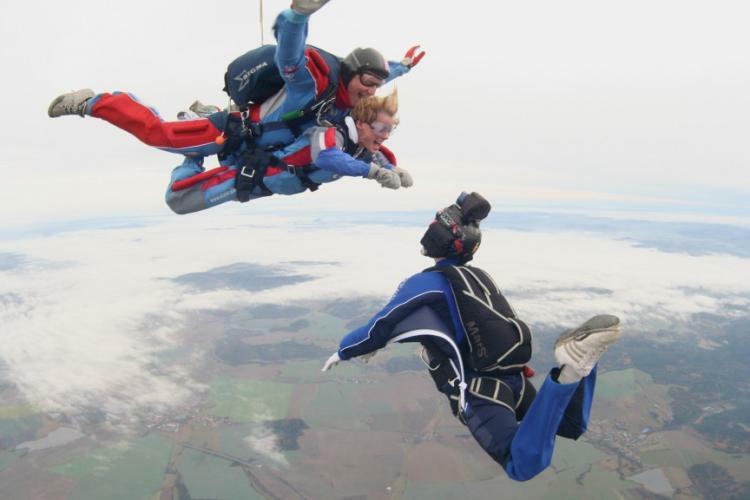 My fingers are clinging behind the straps on my shoulders� I bend my legs at the knees so my feet are not touching the floor anymore, arch in the back, put my head back onto the tandem pilot's shoulder and we jump! What a tornado! The wind seems so strong that I cannot breathe, but I remember to breathe through my nose as I've been advised. We're falling with our bellies towards the ground and I'm just staring at the horizon. . Suddenly there is our camera man in front of me�.we are pulling faces and tongues at each other. Cannot wait to see that video! 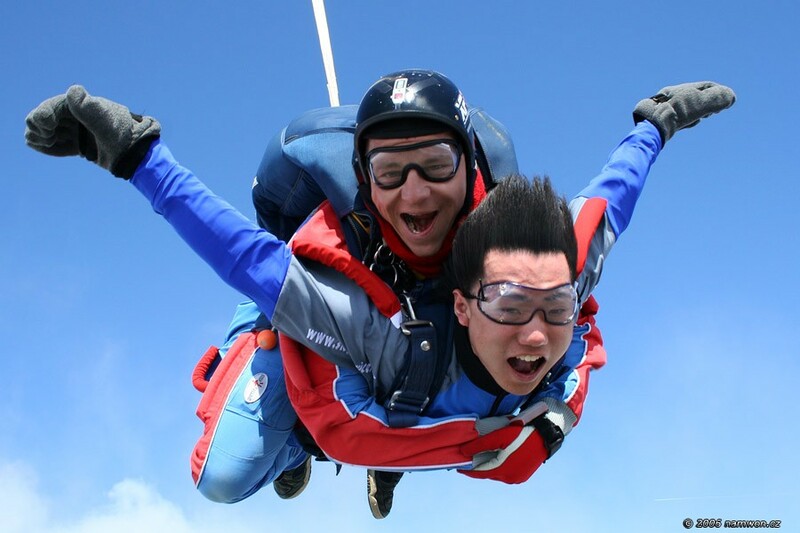 I'm not sure how long we were flying/freefalling just for few seconds or for a while. 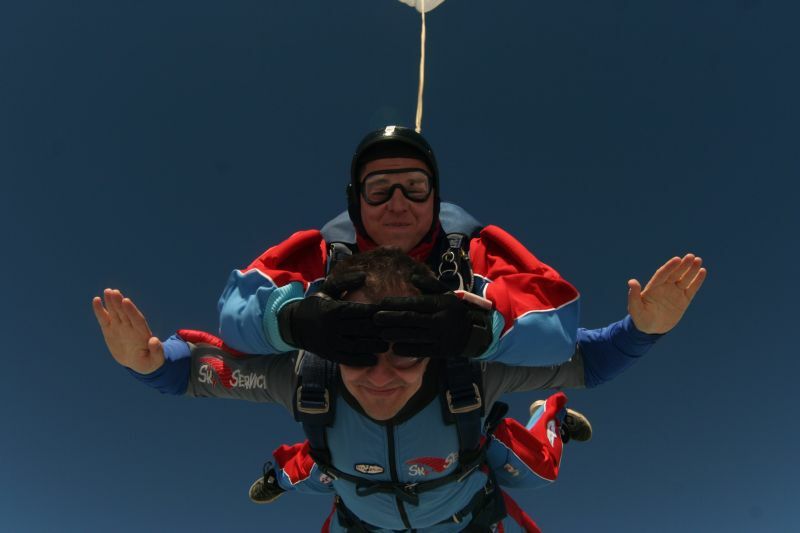 I feel slight pull and suddenly we have a parachute above our heads and the camera man disappears in the abyss below. Oh god, he's going to crash onto the ground! But my tandem pilot assures me that he will be awaiting us on the ground as we land. 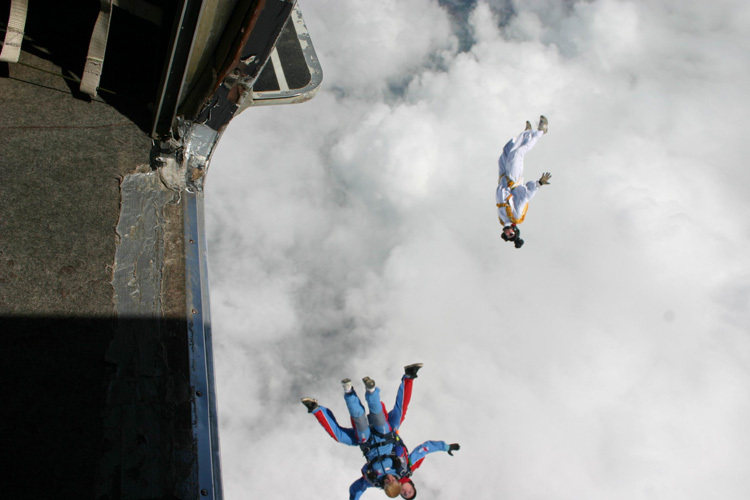 Descending towards the Drop Zone, we are chatting and I'm looking at the world around me. Just few more turns on the parachute and I can even wave to my friends. I stretch my legs in front of me and we land on the grass surface like on the slide. I did it!! What an awesome feeling!! 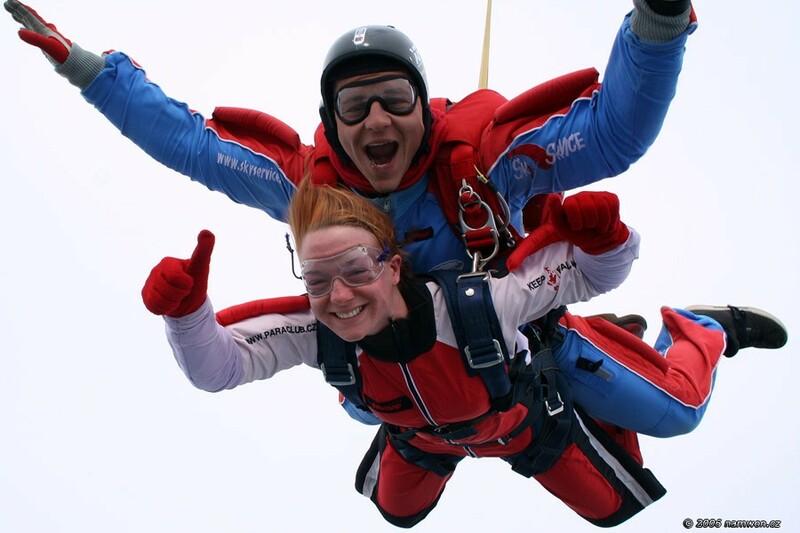 This was my first skydive! The camera man is recording my euphoria and shaking my hand. Few minutes later I receive a DVD with my jump and a cool music in the background. I cannot wait to watch it home and feel the freefall again. 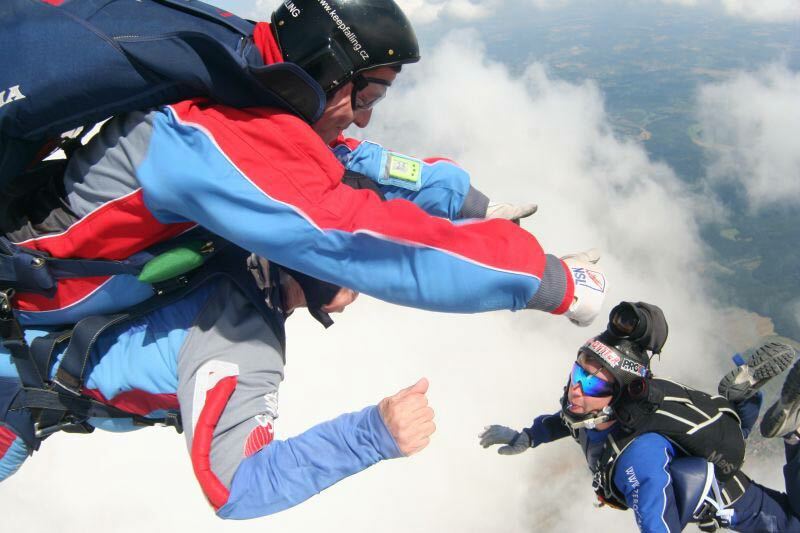 Buying of gift voucher to tandem jump. Groups at least 4 people have discount to 3200,- K�.